Twin Lakes is a new 55+ lakefront community in St. Cloud, Florida. Builder Jones Homes plans to offer about 2,000 attached and single-family homes across 1,100 acres of scenic landscape. Homebuyers will have a variety of beautiful floor plans to choose from that will suit their styles and budgets. This active adult neighborhood will also feature a lavish clubhouse that will sit on the shorelines of Live Oak Lake and offer resort-style amenities. Residents will enjoy plenty of social activities that allow neighbors to build lifelong friendships within a vibrant atmosphere. This active adult community is located close to shopping, dining, beaches, and attractions. It's also just 40 minutes away from Orlando for big-city entertainment and outdoor recreation. The central hub for physical activity and relaxation will be found in the luxurious 20,000 square-foot lakefront clubhouse. Here, residents will be able to stay healthy by using the exercise equipment in the fitness center. A ballroom will be the perfect spot for dancing or attending a social function. A game room and card tables are great for fun nights with friends. Neighbors will be able to grab a drink or snack at the on-site restaurant and bar. Outdoors, homeowners will enjoy a refreshing dip in the resort-style pool or lounge on the patio. Multiple sports courts for tennis, bocce ball, basketball, and pickleball will be available for residents who want to challenge neighbors to a friendly game. Beautiful walking and biking trails, perfect for leisurely strolls, will surround the community. 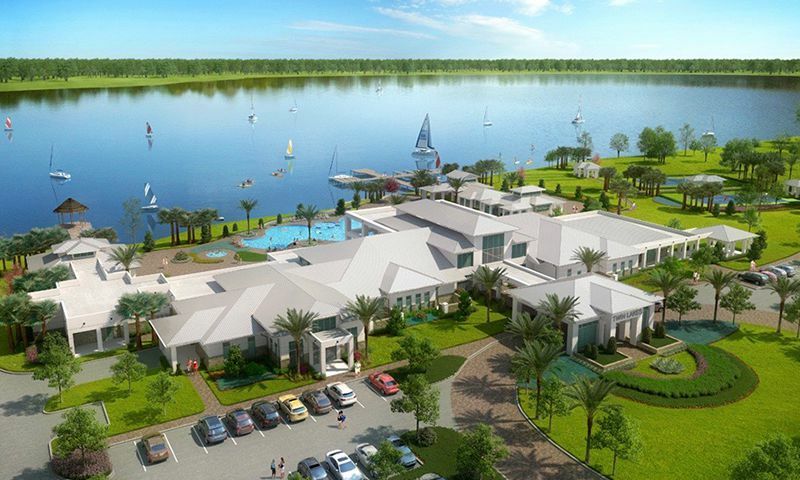 The clubhouse is situated along the shores of Live Oak Lake, which will provide a pier for boating and kayaking activities as well as scenic water views. Jones Homes began construction of Twin Lakes in 2016 and plans to build 2,000 residences. Buyers can choose from a wide variety of floor plans that come in two styles: attached or single-family homes. Active adults will love that these residences have low-maintenance exteriors and scenic views of the lake and lush landscape. There are four unique floor plans that offer 1,351 to 1,449 square feet of living space. These homes have two or three bedrooms, two or two-and-a-half bathrooms, and an attached one to two-car garage. Homebuyers will love the spacious layouts, luxurious master suites, and covered outdoor living areas. Active adults who want more space can choose from eight elegant single-family floor plans. These detached homes comes as one-story or two-story designs and offer 1,596 to 3,146 square feet of living space. They have one to three bedrooms, two to three bathrooms, and an attached two to three-car garage. Some features include inviting living rooms, gourmet kitchens, formal dining rooms, luxurious master suites, and covered outdoor living areas. This vibrant 55+ community will have all of the amenities and activities that active adults could want or need for a social lifestyle. A full-time activities director will also be available onsite to help plan and organize clubs, events, and classes for all residents to enjoy. Homeowners will be able to join card games or participate in holiday events and other social activities. They will also have options for outdoor recreation like swimming, tennis, bocce ball, basketball, and pickleball. With easy access to the lake, residents will also have opportunities to enjoy water sports like kayaking, canoeing, and boating. As the community continues to grow with new residents, more activities will be offered. Located on Hickory Road and south of Route 192, Twin Lakes will be close to shopping, entertainment, and attractions. Residents will be ten minutes from downtown St. Cloud where they will find numerous restaurants, retail shops, a library, and gas station. Just 15 minutes away homeowners will find the VA Medical Center for their healthcare needs. Attractions like Disney World, SeaWorld, and Universal Studios Florida are great for when the grandkids come to visit and can all be reached in about 30 minutes. The beautiful beaches along the Atlantic Coast are just 40 minutes away. For big-city entertainment, downtown Orlando is a 45-minute drive and offers sporting events, performance venues, museums, and fine dining. When traveling long distance is necessary, Orlando International Airport is close by. Active adult homebuyers will love Twin Lakes' prime location and nearby attractions in Central Florida. Clubhouse - 20,000 Sq. Ft. - Coming Soon! There are plenty of activities available in Twin Lakes. Here is a sample of some of the clubs, activities and classes offered here. These plans offer 1,351 to 1,449 square feet of living space. These attached homes have two bedrooms, two bathrooms, and an attached one-and-a-half or two-car garage. Homebuyers will love the spacious layouts, luxurious master suites, and covered outdoor living areas. Please Note: Floor plans are not available at this time. Active adults who want more space can choose from eight elegant single-family floor plans. These detached homes offer 1,596 to 3,146 square feet of living space. They have one to three bedrooms, two to three bathrooms, and an attached two to three-car garage. Some features include inviting living rooms, gourmet kitchens, formal dining rooms, luxurious master suites, and covered outdoor living areas. Please Note: Floor plans are not available at this time. After a five-year search for the best place to retire, my husband and I chose Twin Lakes after the first visit. The beautiful lakefront pier (from which we watched the SpaceX Falcon 9 rocket launch last night) and perfect temperature of the sparkling lap pool lured us, then the great floor plan and affordable home price reeled us in. It also helped that the weather was typical Florida wonderful on that first visit, in contrast to the snowstorms we gladly left behind in NY. We’ve now lived through one beautiful Central Florida winter, with many enjoyable moments together on our screened-in porch. The icing on the cake is that we’ve met welcoming and likeminded people who believe that bridges are better than walls. As for Jones Builders, they’ve gone above and beyond our expectations---we love our gorgeous new home. What a wonderful expercience we had purchasing a new home in Twin Lakes. Everyone we worked with so helpful - and patient! I am so excited about this new neighborhood! I love the floor plan of our new house - I call it my dream house!!! We are looking forward to our move-in date in January 2017. 55places.com is not affiliated with the developer(s) or homeowners association of Twin Lakes. The information you submit is distributed to a 55places.com Partner Agent, who is a licensed real estate agent. The information regarding Twin Lakes has not been verified or approved by the developer or homeowners association. Please verify all information prior to purchasing. 55places.com is not responsible for any errors regarding the information displayed on this website.